4.3 million YA (Years Ago) In what today is Ethiopia, creatures labeled Ardipithecus ramidus lived, represented today by the nickname created by scientists: "Ardi". 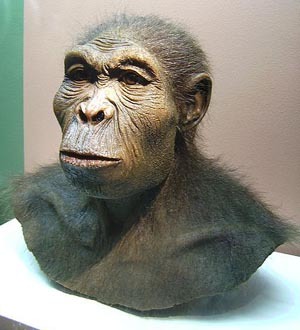 Her species was either directly ancestral to humans or closely related to a species ancestral to humans. She was 1.2 meters (4 feet) tall. She walked on two feet – not knuckle-walking as gorillas and chimps do, but did not have arched feet like us, indicating that she could not walk or run for long distances. She had opposable great toes and she had a pelvis that allowed her to negotiate tree branches well. 3.2 million YA In what today is Ethiopia, members of the biological family Hominidae lived, represented today by the nickname "Lucy." The angle of her knee joint indicates that she walked upright. She was 1.1 meters (3 feet 8 inches) tall. Walking upright improves the ability to run after game and to run from danger. 73,000-68,000 YA The Toba Catastrophe Theory holds that on the island of Sumatra a super-volcanic eruption created a volcanic winter that extended to Africa and reduced the world's human population there to between 1,000 and 10,000 breeding couples. A mini ice age followed, lasting around 1,000 years. Where the eruption occurred a lake developed – Lake Toba. 45,000 YA Humans are in Italy, according to some scholars, reported in Scientific American (20 Aug 2014),"overlapping" with Neaderthals "for up to 5,400 years in parts of southern Europe, yet to a much lesser extent or not at all in other parts of the continent." 40,000 YA Near what today is Beijing, human bones dating to around this year have been found. At	least one person to whom these bones belong wore shoes. According to Erik Trinkaus of Washington University in Missouri, evidence also exists of some shoe or sandal wearing among Neanderthals. 40,000 YA Neanderthals "disappear from Europe" around now according to Scientific American, (20 Aug 2014). 27,000 YA Climate change has produced ice now at a peak in covering something like two-thirds of Europe. Hunter-gatherer societies "ebbed and flowed" according to Mirazón Lahr, from Cambridge's Leverhulme Centre for Human Evolutionary Studies (LCHES). In other words some groups died and some survived. The ice was to start melting 17,000 years later.